September is an important month for American schools, students, and teachers. This is the time when the school year begins. Back to School means that students turn their attention from summer vacation and playing outside to studying subjects, like reading and writing, at school. Reading and writing are important because they help develop students' literacy. 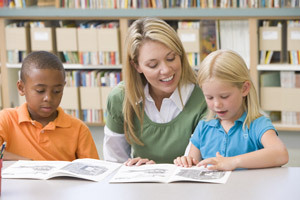 At school students read many different genres of texts such as poems, short stories, novels, non-fiction, and more. Students write short essays, letters, book reports and other assignments. Literacy, the ability to read and write, is the most important skill children learn in school. This fact was recognized in 1965 by the United Nations Educational, Scientific, and Cultural Organization (UNESCO) when it created International Literacy Day. September 8 is the day to remember the importance of literacy for individuals and communities around the world. The day also highlights the fact that not all children learn how to read. UNESCO reports that 1 in 5 adults in the world are not literate and 2/3 of these illiterate adults are women. In the United States, libraries and literacy organizations hold special events, such as public readings and used-book sales to celebrate International Literacy Day and raise awareness of illiteracy. The celebration of literacy continues through the end of September with Banned Books Week. In 1982, the American Library Association's Office for Intellectual Freedom gave the last week in September this title. Banned Books Week celebrates people's freedom and right to read. This week also protests the practice of banning books. In the United States, banning books is seen as a form of censorship, which limits people's access to information. Some people want to ban books by removing them from the library or school curriculum because of their content. Americans celebrate Banned Books Week by attending public readings of banned books, sometimes by famous authors and important public figures. How do you get ready to go back to school? How will you celebrate International Literacy Day? Do you ever think banning a book is the right thing to do? Why or why not? Fables are a type of short story that are commonly read with children. Fables are used in American schools to help students develop their literacy and to help teach a moral, or a lesson. Aesop's fables are well known books and are traditional bedtime stories for children. For this activity, first choose one of Aesop's fables listed below to read with your class. Article Summary: Around the world, governments and organizations are joining together to celebrate International Literacy Day. Worldwide, almost 800 million people can neither read nor understand numbers, and 64 percent of them are women. The links between literacy and individual economic prospects are self-evident, but this year UNESCO points up the connection between literacy and achieving peace. Literate individuals have better health, are more prosperous, more effectively participate in their communities, and are more like to support safe and stable governments. The organization called All Children Reading reports that poverty could be reduced for 171 million people in the world if children developed basic reading skills. Abundant data demonstrate how literacy improves lives, prospects, and prosperity. Unfortunately the lack of resources is the fundamental reason for illiteracy and inadequate educational infrastructure. Families might not be able to pay for school, or governments might not have the money to pay teachers' salaries. In some cases, cultural and security issues can limit educational opportunities, especially for females. Former Secretary of State Hilary Clinton, however, has noted the success of efforts aimed to increase the enrollment of females in schools in Afghanistan. Other organizations such as the Millennium Challenge Corporation (MCC) are continuing to work for increased literacy around the world. In Morocco, for example, the MCC has invested about $33 million in a program to improve literacy. Since 2009, more than 70,000 people have joined this literacy program and 65% of these individuals are women. Why it is important to be literate? How can you use literacy to encourage peace? What are ways your community and country are promoting literacy? How would your life be different if you were not literate? After answering the questions, have each group use their responses to select some important words and phrases. Have them use these words and phrases to construct a collage on a poster containing images and words to explain the importance of literacy. (You may need to prepare before the lesson by bringing magazines, sheets of paper, scissors, glue or tape, or other necessary materials to class for students to use.) Hang these posters in the classroom or hallway of your school to encourage peace and literacy.